Our house is set in “wine country” North Fork, no ocean beaches - but many small bay and sound beaches. Our house sits on a saltwater inlet and has a very peaceful water view of the inlet which rises and falls with the tide. Located in Mattituck, this cottage is less than a mile to the famous and quaint Love Lane, with its bucolic shops including the North Fork favorite Love Lane Kitchen. Oregon Road is a simple bike ride away, where you will find charming farmhouses, a sunflower farm, and North Fork favorites Shinn Estate Vineyards & Lieb Cellars. Ballie Beach is an easy 2 miles from the cottage. The cottage sits on a quiet side street along the Mattituck Inlet with direct creek access. Most residents and renters along this very creek have been returning for up to 30 years, it must be a special place. Down the road from Marina with salt-water pool, waterfront and outdoor dining including special events and live music. The backyard facing the creek is a perfect place for relaxing or playing bocce ball. Come nightfall, stargaze and make s’mores by the fire pit. There is a folding table with table linens and chairs available if you want to have a picnic dinner under the stars. Bring your kayak or canoe (or rent them at the nearby marina), you can access the saltwater inlet from the backyard! There are also 2 stand up paddleboards available for use. The cottage has 3 bedrooms. Two bedrooms have double beds. One bedroom has a queen bed. Linens are included (sheets/blankets/bath towels and beach towels). Double air mattress and pack n play crib are both available. There is a cozy sunroom with couches and reading chairs that comfortably seats 6, a TV with DVD player, two large floor cushions, a coffee table perfect for board games, and a selection of DVDs, books, and games. The house is equipped with wi-fi and Google Chromecast. The kitchen is stocked with utensils, dishes, pots and pans. There is a mango-wood farmhouse dining table for six people (extra chairs are available). There is an upstairs bathroom with walk-in shower and heat fan (for cool mornings), a half bath powder room downstairs, and an outdoor cedar shower. The North Fork has the best of everything, and this cottage is the perfect charming getaway from the busy grind. It will take you back in time to when living was simple. Quiet and slow pace, relaxed and casual living, near to beaches, countless vineyards and farmstands, and great restaurants. For a slightly quicker pace, Greenport is a short 20 minute drive away. 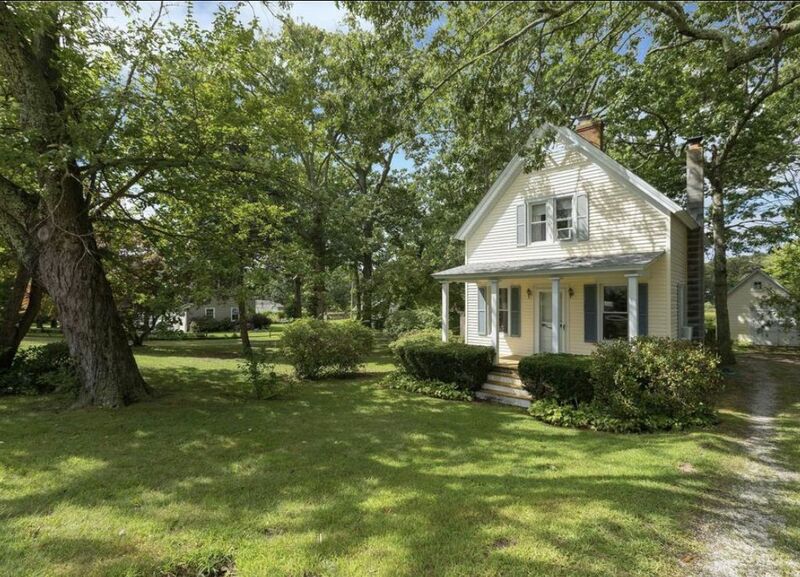 Mattituck is ideally located in the center of everything on the North Fork. We also are more than happy to provide vineyard/winery, activities, and restaurant recommendations. The two-week rentals begin Saturday at 3pm with check-out the second Saturday at 10am. We are willing to accommodate flexible arrangements if available. If you have any special requests, please do not hesitate to ask. We want to make your stay as comfortable as possible. We also provide detailed recommendations and can assist with itineraries. We live in Westchester County primarily, but we love coming out to the North Fork to get away for a relaxing vacation. We first came to to North Fork on a long weekend to do some wine tasting. We loved the laid-back nature of the area and the breath-taking scenery of undeveloped land. We purchased the cottage from a lovely family who had used it as a summer home for 30 years. It is a special place, and we look forward to sharing it with others. To us, the North Fork has the best of everything. Quiet and slow pace, beaches, vineyards, and great restaurants. Love Lane is heaven for foodies like us, with the local cheese and chocolate shops, the new Love Lane gourmet market, and of course Love Lane Kitchen. If you are lucky, you will get to see a stunning pink sunset over the northwest side of the Sound. The sky turns amazing shades of bright pink, purple, and blue. It is simple living at its best out here. While staying at the property, we like to go paddleboarding on the Inlet, play bocce ball on the beach, visit favorite and new Vineyards, we will often try a new recipe to cook, and we often stop by Love Lane Kitchen for the ricotta lemon pancakes, or portobello sandwich, and we always, always stop by the Sweet Shoppe! All bedrooms and main living area have window air-conditioner units. My family of 5 loved this beautiful house in Mattituck. We especially loved the paddle boards that were provided. The inlet behind the house was perfect for our daughters' first go at paddle boarding & our son playing in the sand. It was quite peaceful & the variety of birds kept our eyes open. The area was also ideal with close proximity to vineyards, Greenpoint & farmers markets. It was our first time at North Fork & the house really did provide a home away from home. I would recommend it to anyone. Great vacation house for family! My husband, our 2 year old and I had an awesome time at Sing's house this past week. The house is adorable, clean, well stocked and plenty of room for our family. There are great restaurants, wineries and beautiful beaches within just a few minutes driving. Sing was such a great host and responded to us so quickly if we needed anything. We had such a fun week and will definitely be back. We, a family of four, stayed at the house for a week in early August 2017. We had a very enjoyable stay and found everything, the house and its facilities very much to our liking. The house is located close to Love Lane and right next to the Mattituck inlet. It has a fireplace for buildings campfires right next to the waterfront. We felt very much at home there and especially liked the kitchen and the master bathroom. Highly recommended! My wife & I stayed here with our 2 adult daughters and our son-in-law 8/6/16-8/13/16. There was plenty of room here for 5 adults. The 1st floor included a bright and airy sunroom with aTV and DVD player (Chromecast included but no cable or network TV); a good-sized, well-equipped kitchen; a dining room with a large natural wood table and a corner cabinet filled with lots of games; one bedroom with a double bed; and a small powder room. Upstairs was the master bath with a spacious shower and updated fixtures, but with a rustic feel. There were 2 bedrooms, one queen and one double; all the beds were very comfortable. Each bedroom and the dining room had a window AC unit which kept us quite comfortable despite a week of 90+ degree days. Standing fans allowed us to direct cool air into the kitchen and sunroom. The house has a great location in Mattituck, central to all the attractions of the North Fork, and the yard backs onto Mattituck Inlet which runs out to Long Island Sound. We kayaked (rented from Eagle's Neck Paddling Co) and paddleboarded (2 in the garage) right from the backyard! The launch area does get mucky at low tide. The garage also had a rowboat and some PFDs, 2 adult bikes and several beach chairs. We used the gas grill on some fresh fish from Braun's Seafood in Southold and chicken from the grocery store in Mattituck Plaza, both just a short drive away. The backyard also had a stone firepit and Adirondack chairs to sit around the fire or to watch the sunsets over the inlet. Love Lane, with its shops and Love Lane Kitchen (great for breakfast/brunch/lunch) is just minutes away, and 40+ vineyards are within a short drive (we enjoyed tastings at Martha Clara, Macari, Sparkling Pointe, Lieb and Duckwalk). We had wonderful meals at A Touch of Venice in Cutchogue, A Lure, with outdoor dockside seating, in Southold and Jedediah Hawkins Inn in Jamesport. Not to be missed is ice cream from The Magic Fountain, offering over 30 flavors, right in Mattituck. We went to 3 beaches: Orient Point State Park on Gardiner's Bay at the end of the North Fork; Breakwater Beach on the Sound at he mouth of the inlet (both beaches were a bit rocky), and Bailie Beach a nice, sandy beach east of the inlet. Unfortunately, you need a resident's pass to park anywhere near this beach-perhaps one could be provided for future guests? Our host, Sing, was readily available by email to answer questions with a prompt response. Would love to stay here again-highly recommended! Thank you very much for the opportunity to spend Easter weekend in Mattituck. We enjoyed kayaking, fishing and an Easter egg hunt all in the backyard. We also had a delightful brunch at Pace's today before heading out. We rented this cottage to attend a family wedding. We were 3 adult couples and the cottage was perfect. We loved the rustic cottage feel, yet we had everything we needed. It would have been nice to be there in the warmer weather, maybe next time. Rates include use of rowboat, 2 stand up paddle boards, and 2 adult bicycles. Security deposit is required, will be refunded within 30 days of check-out. 50% deposit is required to reserve dates. Final Balance + Security Deposit due 2 weeks prior to rental start date.